I was bored at work yesterday afternoon and decided to see if I could answer the question, "which is the most popular UK predator?" There's no denying that interest in predator fishing, especially lure fishing is exploding in the UK right now, but which predators really interest anglers the most? 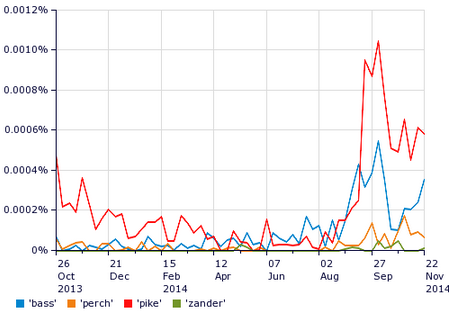 I used UK search engine data from the last 13 months to plot this graph, showing the amount of searches (including hundreds of variations) for Perch, Pike, Zander and Bass fishing. The results weren't what I expected. It certainly feels like Perch fishing has all the buzz right now, but this insight appears to show that Pike is still the more popular of species, and a real shock, Bass fishing is more popular than Perch fishing - certainly in terms of internet searches anyhow. Possibly the Bass searches are inflated by UK interest in Freshwater Bass like Largemouth (although I did exclude direct references to foreign bass species). Anyway, interesting I thought. What do you think? Is this what you would expect?